Since it is summer-time and I am working on a book, I am going to re-post my retrospective of the post-apocalyptic Filmation series Ark II for the next few weeks. I'll blog a fresh series in the fall! Ark II aired on Saturday mornings beginning September 11, 1976 and ran for fifteen 22-minute episodes. Like many science fiction TV efforts of the time, it was rather determinedly a “civilization of the week” program; meaning that each week, the diverse protagonists traveled (usually by a ground vehicle; sometimes on foot…) to a new and strange civilization. Basically, it was Star Trek all over again, only without the U.S.S. Enterprise and outer space as useful backdrops. With some variation, the format was seen in The Starlost (1973), Planet of the Apes (1974), Logan’s Run (1977) The Fantastic Journey (1977) and in the 1980s program Otherworld, to name a few examples. Star Trek creator Gene Roddenberry himself had attempted to take the civilization of the week formula to new heights with Genesis II and Planet Earth, two made-for-tv movie/backdoor series pilots from the early 1970s. Although it aired during America’s optimistic bicentennial year, Ark II was set in the new Dark Ages of 25th century, and focused on a large, impressive, high-tech tank-like vehicle, the Ark II, which traversed the wasteland in order to aid the survivors of an environmental disaster. Specifically, the crew of Ark II consisted of the bearded Captain Jonah (Terry Lester), scientist Ruth (Jean Marie Hon), and young scholar Samuel (Jose Flores). In a weird, unspoken acknowledgment of Planet of the Apes’ continuing popularity, these young humans also traveled with a talking chimpanzee named Adam who could play chess and drive the Ark in a pinch. You may have noticed that all the crew names listed above arise from Judaism, and thus carry resonances beyond the obvious. In the Hebrew Bible, Jonah was a “truth seeker,” which is a term you might use for the stalwart captain of Ark II. Ruth was the name for a “companion,” in the same text, and Samuel was a man on the cusp of two eras, the last Hebrew judge and the first prophet. Similarly, on Ark II, the young Samuel is a child of the Dark Age who will also live in the period of the New Enlightenment, or recovery. As for the ape, he is named for Adam, the first human male. The name “ark,” of course, calls up imagery of Noah’s Ark, the craft that repopulated the Earth after a disaster, the Great Flood. The first episode of Ark II is called “The Flies.” Written by Martin Roth and directed by Ted Post, it finds Captain Jonah recording his log entry numbered 1444. The Ark is patrolling Sector 83, Area 12, investigating a gang called “The Flies” that is responsible for “serious infringements on the rights of the others.” The assignment: bring “discipline” and “reason” into their lives. The name “The Flies” conjures images of William Golding’s novel Lord of the Flies (1954), which also concerned a society of children. 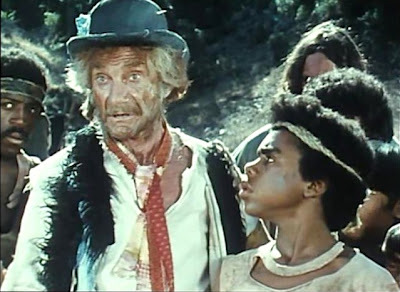 Unfortunately for Jonah, the Flies -- an interracial gang of youngsters -- are entirely loyal to their leader, a rapscallion named Fagan and a scoundrel played by the one-and-only Jonathan Harris, Lost in Space’s Dr. Smith. Fagan is named after Charles Dickens’ famous Oliver Twist character Fagin, a “receiver of stolen goods” and man who encourages a life of crime in children, turning them into thieves. In Ark II’s “The Flies,” Fagin and his group of thieves discover ancient poison gas canisters, ones that are still functional. Ruth, Samuel and Adam save Jonah and free Fagon and the Flies from warlord subjugation. They also retrieve and dismantle all the dangerous gas canisters without ever resorting to violence. Instead, they neutralize the gas and change it into Nitrous Oxide (laughing gas). Although the series is now over forty years old, the look and production design of Ark II remains admirable. 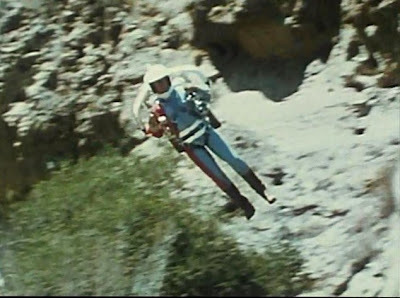 The main cast, for instance, wears skin-tight and attractive space-age uniforms with computerized belts and cuffs (replete with wrist communicators). 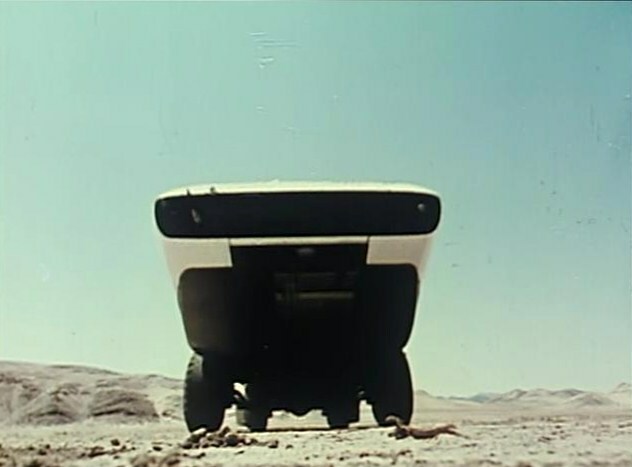 One can see how this design influenced later Star Trek outings, including The Motion Picture (1979). 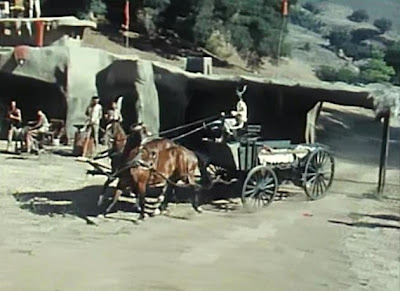 Also the exterior, post-apocalyptic set design is kind of interesting: a mix of the Old West, Vikings, and the aforementioned Planet of the Apes. 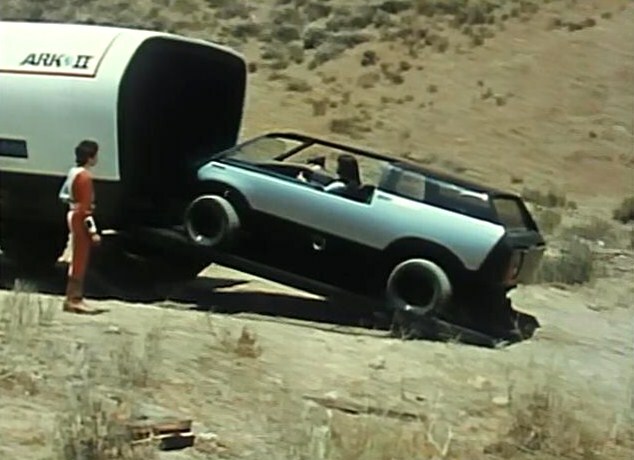 Interestingly, Ark II presages the barbarity and chaos of The Road Warrior (1981) on a TV budget and within TV restrictions. 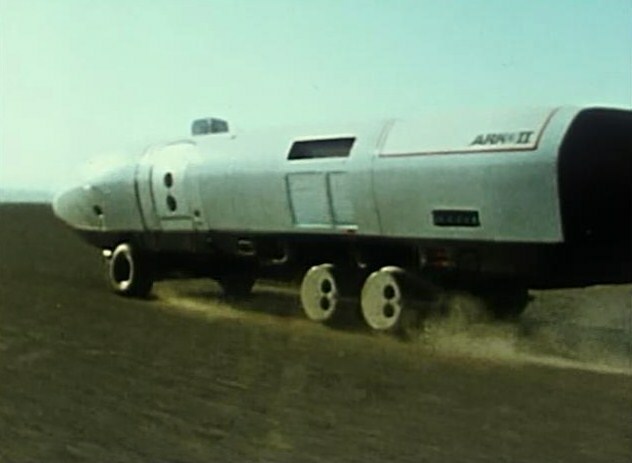 The Ark II itself, built by the Brubaker Group, remains a remarkable piece of hardware, a life-size, operational vehicle. It looks thoroughly convincing….especially in motion. In the series, this high tech truck is equipped with a protective force field. The Ark II also billets a smaller exploratory vehicle, the fast-moving roamer. I find it fascinating that Ted Post directed this premiere episode of Ark II. A veteran director of The Twilight Zone and Boris Karloff’s Thriller, his movie career had taken off in the early 1970s with Beneath the Planet of the Apes (1970) and the Dirty Harry sequel, Magnum Force (1973). John, excellent review of Ark II "The Flies". 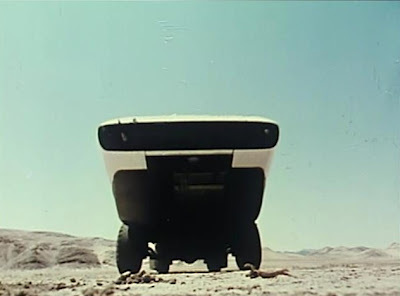 You are so right about the production design of Ark II still being impressive and about this being a Saturday morning version of The Road Warrior (1981). This was '70s children series that one can only imagine how it would have been as a prime-time series. It needs a reboot. I still consider Ark II one of the best science-fiction series ever made and is one of my favorite television series. The non-Gene Roddenberry involved third attempt called Strange New World(1975) pilot, complete with their Ark II called PAX Vesta Explorer, should be mentioned too. I am so glad that you are re-posting your Ark II reviews.